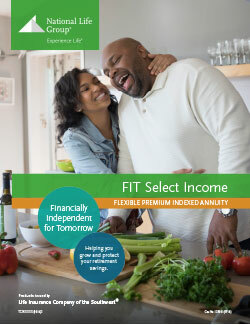 Our new FIT Retirement Series lets you choose from four flexible premium indexed annuities to customize a strategy for each client’s specific accumulation and income goals. MORE Upside: Tax-deferred interest crediting potential, 0% floor guarantees1 and a wide selection of index strategies to benefit and protect from market conditions. MORE Liquidity: A free withdrawal feature in years 2+2 and, for 403(b) and 457(b) policies, an emergency access waiver with no charges or MVA. MORE Options: Two new, exclusive low-volatility index strategies provide clients with more choices among low-volatility crediting methods. Whether they want to self-distribute or prefer a guaranteed income stream, your clients can find the best FIT for their short- and long-term accumulation and income needs. Fills the need for an initial boost to savings that will help add to overall accumulation as retirement gets closer. Helps meet multiple needs including a medical emergency to protect savings3 and guarantee lifetime income. 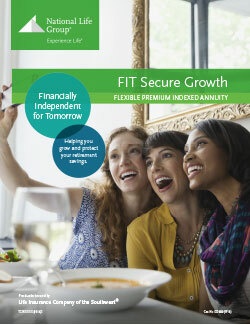 Meets the desire for growth and protection of hard-earned savings with the flexibility to self-distribute down the road. Addresses combined goals of saving more now while providing the potential for increasing future income, then locking in any increases. 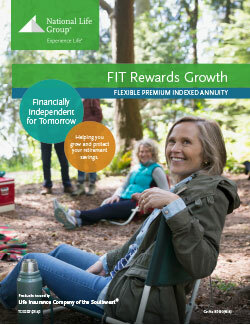 FIT Retirement Series offers many indexing choices to widen your customers’ crediting options as their needs change over time. The Barclays Low Volatility 5 Index and Bank of America/Merrill Lynch GPA Index are exclusive to National Life Group, and all offer the downside protection of a 0% floor guarantee. We also offer Annual Point-to-Point with Cap and Declared Rate strategies. All, except for the Annual Monthly Sum Cap S&P 500 Index (see below), are credited based on the index change from the beginning to the end of the year, and are adjusted by either a Cap, Participation Rate or Threshold, depending on the index. Moreover, customers are free to allocate their values among the different index strategies at any time, within certain guidelines. 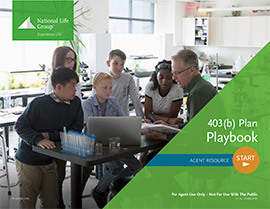 Developed just for National Life Group, this index tracks the performance of 50 value-oriented stocks that exhibit lower price volatility compared to the overall market. The tracked companies represent established (min. $5 billion market capitalization), stable firms and are diversified across sectors. Barclays will alter the group’s composition to respond to changing market conditions. Designed to control volatility, this index has no need for a cap. 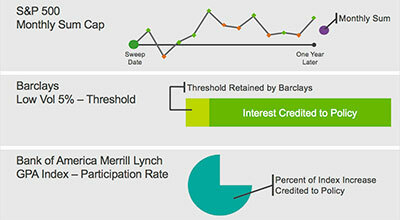 Interest is credited above Barclays pre-determined Threshold, which is declared at the start of each account year. The maximum Threshold is guaranteed at 10%. Also created just for National Life Group, this index aims to minimize volatility through a blend of equities, Real Estate Investment Trusts (REITs) and bonds. BofAML rebalances allocations to help capture gains and reduce risk, and applies a stop-loss mechanism that reduces exposure to underperforming asset classes. Its volatility controls result in no need for a cap. Interest is based in part on the Participation Rate, which is set each year. The guaranteed minimum participation rate is 10%. This index tracks the performance of the S&P 500 Index, the world’s leading benchmark comprised of 500 leading companies based on market capitalization. The Cap is determined at the start of the account year. We guarantee the annual Cap will never fall below 1% for this index. This index also tracks the world’s premier equities benchmark, but its credit is calculated based in part on the 12 monthly changes in the index during the year. Unlike the point-to-point crediting method, we apply the Cap to each monthly change, then total the 12 months (both positive and negative) to determine the credited amount. This crediting method offers strong interest potential during market upturns. The Cap is determined at the start of the account year. The guaranteed minimum monthly Cap for this index is 0.25%. A basic yet effective indexing approach, in which interest is credited daily at a declared effective annual rate that we set at the start of each one-year crediting period. We offer a 0.25% minimum declared rate guarantee for this strategy. The GLIR rider ensures that customers have the option to receive retirement income that they can never outlive, while leaving them in control of their remaining accumulation value. The rider is required, at additional cost, on FIT Select Income and FIT Certain Income and is not available on FIT Rewards Growth and FIT Secure Growth. Easy funding choices can help FIT Retirement Series customers go with the flow. Regularly scheduled contributions can be a low as $100 a month, using either payroll deduction or bank drafts. Or, clients can start a policy with a single premium of $5,000 or more and add additional money down the road. You can project the Guaranteed Lifetime Income Rider (GLIR) on the fly for FIT Certain Income and FIT Select Income through the Quick Quote agent mobile app for phones and tablets. The app – for agent use only – is designed to help you save time as you prepare for more detailed client discussions. The FIT Retirement Series Emergency Access Waiver is available after the first policy year to use after an unforeseen hardship, such as a medical emergency, or after a separation from service or disability. For TPA-approved hardship or unforeseen emergency distributions payable to the annuitant, beginning in the second policy year the waiver forgives all withdrawal charges and Market Value Adjustment. Policy must be in 403(b) or 457(b) status. Keep in mind, any distributions are subject to federal income taxes and, if applicable, a 10% early distribution penalty. Freedom from restrictions due to having other plans or products, as well as no RMDs7 nor 10% early distribution penalties on original investment amounts. More distribution options for non-spousal beneficiaries. The FIT Retirement Series is not available in NY. 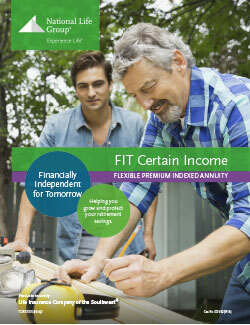 FIT Retirement annuities and riders issued by Life Insurance Company of the Southwest. Consumer materials linked to on this page are approved for print use only. Please note that email marketing is subject to additional anti-spam requirements, and should be submitted for advertising compliance approval prior to use. Guarantees are dependent on the claims paying ability of the issuing company. Withdrawals from an annuity within a retirement plan may be subject to plan restrictions. In addition, withdrawals prior to age 59½ may be subject to a 10% Federal Tax Penalty. Assuming no withdrawals during the surrender charge period. Rider charges continue to be deducted regardless of whether interest is credited. An illustration is intended to show how the features of the annuity work. It is not a projection of future values. Maximum annuity contributions may apply. For new premium only. 1035 exchanges may be partially taxable at distribution. RMD rules may vary by state. Diversification and asset allocation employed by the managers of the indexes underlying the index strategies does not assure a profit or guarantee against a decline in the index. “Standard & Poor’s®”, “S&P®”, “S&P 500®”, and “Standard & Poor’s 500™” are trademarks of Standard & Poor’s and have been licensed for use by National Life Insurance Company and Life Insurance Company of the Southwest. This Product is not sponsored, endorsed, sold or promoted by Standard & Poor’s and Standard & Poor’s makes no representations regarding the advisability of investing in the Product. The S&P Composite Index of 500 stocks (S&P 500®) is a group of unmanaged securities widely regarded by investors to be representative of large company stocks in general. An investment cannot be made directly into an index. Merrill Lynch, Pierce, Fenner & Smith Incorporated and its Affiliates (“BofA Merrill Lynch”) indices and related information, the name “BofA Merrill Lynch”, and related trademarks, are intellectual property licensed from BofA Merrill Lynch, and may not be copied, used, or distributed without BofA Merrill Lynch's prior written approval. The licensee's products have not been passed on as to their legality or suitability, and are not regulated, issued, endorsed, sold, guaranteed, or promoted by BofA Merrill Lynch. BOFA MERRILL LYNCH MAKES NO WARRANTIES AND BEARS NO LIABILITY WITH RESPECT TO THE INDICES, ANY RELATED INFORMATION, ITS TRADEMARKS, OR THE PRODUCT(S) (INCLUDING WITHOUT LIMITATION, THEIR QUALITY, ACCURACY, SUITABILITY AND/OR COMPLETENESS). Neither Barclays Bank PLC, or Barclays Capital Inc., nor any affiliate (collectively "Barclays") is the issuer or producer of FIT Rewards Growth Flexible Premium Indexed Annuity ( “FIT Rewards Growth”) and Barclays has no responsibilities, obligations or duties to purchasers of FIT Rewards Growth. The Barclays Low Volatility 5 Index including as applicable any component indices that form part of the Barclays Low Volatility 5 Index is a trademark owned by Barclays Bank PLC, or Barclays Capital Inc., and licensed for use by Life Insurance Company of the Southwest as the Issuer of FIT Rewards Growth. While Life Insurance Company of the Southwest as issuer of FIT Rewards Growth may for itself execute transaction(s) with Barclays in or relating to the Barclays Low Volatility 5 Index in connection with FIT Rewards Growth purchasers acquire FIT Rewards Growth from Life Insurance Company of the Southwest and purchasers neither acquire any interest in the Barclays Low Volatility 5 Index nor enter into any relationship of any kind whatsoever with Barclays upon making a purchase of FIT Rewards Growth. The FIT Rewards Growth is not sponsored, endorsed, sold or promoted by Barclays and Barclays makes no representation regarding the advisability of FIT Rewards Growth or use of the Barclays Low Volatility 5 Index or any data included therein. Barclays shall not be liable in any way to the Issuer, purchasers or to other third parties in respect of the use or accuracy of the Barclays Low Volatility 5 Index or any data included therein.